Tri-Village graduate Alisha Hollinger signed her letter of intent to compete for the Indiana University East track and field team. RICHMOND, Ind. 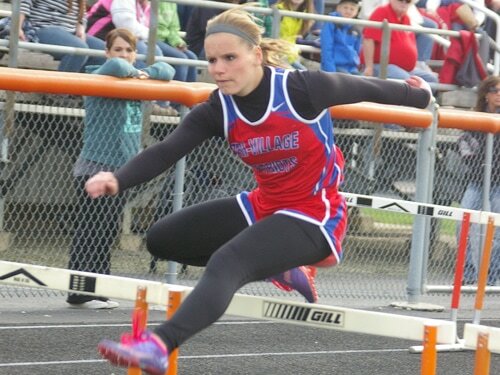 – Alisha Hollinger, a recent Tri-Village High School graduate, has signed a letter of intent to compete in track and field at Indiana University East starting with the 2015-16 school year. Hollinger was a track and field regional qualifier in the 100 meter hurdles and 300 meter hurdles in 2014. She scored in both hurdles events and in the long jump in the district meet as a senior. She reports personal best times of 16.59 in the 100 meter hurdles, 47.68 in the 300 meter hurdles and 15 feet 9 inches in the long jump. Alisha is the daughter of Brent and Jennifer Hollinger. She plans to major in elementary education. “I chose IU East because it is a small school and close to home with a good education program and the opportunity to run and hurdle,” Hollinger said. Hollinger joins Grace Rusche of Lapel, Autumn Kann of Triton, Kelsey Anderson of Arcanum, Trisha Spivey of Union County and Tessa Rhodus and Kaylee Simpson of National Trail in IU East’s 2015 women’s cross country and track and field recruiting class. IU East is an NAIA program. The Red Wolf cross country and track and field programs have been represented at the NAIA national meet six times in seven years of NAIA competition.